Young people in Texas are supposed to be adventurous, so I wasn’t at all surprised when my brother Davey grew up to be an oil worker. I never had a clue what got into him three years ago, though, when he moved to Alaska to work in the oilfields of the Arctic Circle. He had plenty to say about the beauty of the midnight sun, the aurora borealis, and the caribou herds thundering across the tundra; but as for me, well, I wouldn’t take all that in trade for one perfect peach from Gran’s backyard tree. Davey got married last year. He met his bride Rosa, an Alaskan Native who grew up in a small village, when she started working for the oil company as an industrial nurse. Just before the Fourth of July, he brought Rosa and her mom Celeste here to Amarillo for a week’s visit. Both mother and daughter smiled a lot and were short and plump; they had lovely smooth complexions and big, dark, alert eyes. Celeste hadn’t ever traveled outside Alaska before. 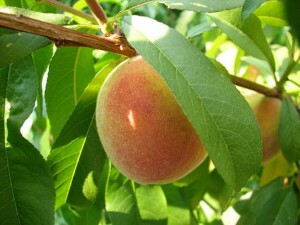 When I gave her a fresh-picked peach, she closed her eyes in delight after the first bite, with the juice running down her chin unnoticed. The week went by all too fast. After we took our visitors (and how strange to think of Davey as a visitor!) to the airport for the return flight, Gran shook her head in pity as we started walking back across the parking lot. Her steel-gray curls drooped in the waves of heat rising from the asphalt. “Just imagine, Lori Beth—imagine, not even or really ever tasting a peach until well over 50, not once. Oh, I suppose they must have grocery stores in Alaska, but really,” and Gran waved a hand dismissively, making clear that she wouldn’t count rock-hard peaches in grocery stores as real fruit or anything close to it. I was just about to agree with her, and then I started thinking about when I’d first come here. Davey and I were born in San Diego. The first time we ever saw snow was when Mom brought us to Amarillo for what she said was a Christmas visit, just as a ferocious winter storm blew in off the prairie. We gleefully ran around building snowmen and snow castles, never thinking about why Mom crammed the old Ford’s trunk full of all our clothes if we were only staying for Christmas. Every time one of us asked when we’d go home, Gran just said, “Well, bless your heart, child,” and sent us out to play. We had no idea what was going on until some kids at our new school explained what a divorce was. “I never saw snow till I was five,” I said, watching a plane’s takeoff as it circled around to the west, its long curved trail streaking into the setting sun. Davey had told me that Rosa and Celeste’s ancestral language had dozens of words for different kinds of snow. Heavy and wet, powdery and light, a soft fresh snowfall on bare ground, old snow half-melted and then refrozen smooth as glass—when I thought about it, I saw how there could be so many words. But living in Texas, I’d never had occasion to think about it before. Following my gaze toward the departing jet, Gran shook her head again. This was a different motion—a quick, impatient tossing of her curls as if to shoo away unwanted thoughts, like a mare plagued by flies. Yum, and thanks. 🙂 I am sure I can do something tasty with that! What a wonderful true story!! I’m sure they will be happy, and next time when they come to visit…hopefully not too many snows from now …she can taste a fresh peach again. Hi Tiny — not really a true story, but I’m glad it seemed like one!